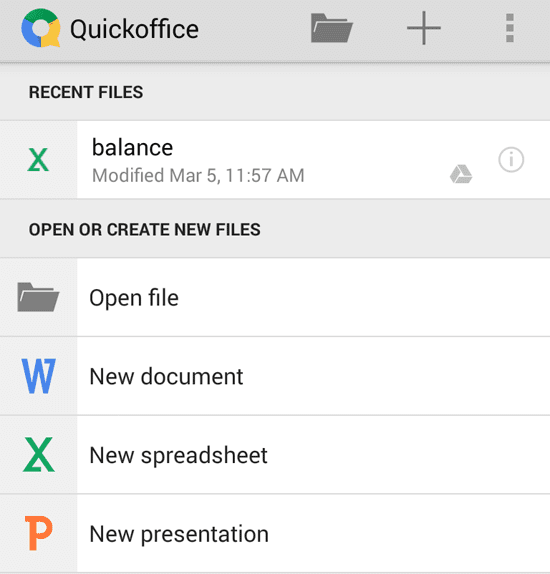 If you are looking to view and edit Microsoft Office documents in your mobile phone, then one of the best apps you can use is Quickoffice. This is a free app by Google which provides several features so that your mobile device can have a complete office suit. If you are used to creating and editing Word, PowerPoint and Excel documents in your PC, then you might want to have a similar app to do the same thing in your phone. For that Quickoffice is a suitable alternative. This app is free, for both Android as well as iOS device. I use the Android version and I am pretty much satisfied with it. It fulfills my needs of opening spreadsheets in my phone every once in a while. Besides spreadsheets, it also completely supports Word documents as well as PowerPoint presentations. It gives you the power to create and edit office documents on the go. Perfect for Microsoft Documents: Quickoffice supports Microsoft Word documents, Excel spreadsheets and PowerPoint presentations. This is an all in one office package for mobile devices. Support for PDF Documents: You don't even need to use a separate PDF reader for your phone. This app not only supports Office files but also is able of opening PDF documents. Integrated with Google Drive: Google Drive is Google's cloud storage solution for all types of files. This includes storing office documents as well. You need a Google account for this. After integration, your documents will be uploaded to the cloud and they can be accessed from the PC using Google Drive. Sharing with Ease: You can also use your phone's sharing feature to share the documents that you created. You can send office files using Bluetooth or via Gmail. These features are available directly in the app. Uploading your files to the cloud in a shared folder, automatically shares your file online.